If we had better resources to pay assistant coaches, I would probably have some contrarian takes about hiring internally all the time. But because we don't, it's a necessary precaution to do so. We can debate whether or not we can win with or without an option offense but I think we can all agree Wofford is severely outmatched if we turn into a coaching carousel with assistants having minimal bonds to the college. Wow, MAJOR issues with coaches and athletic dept., uprising, BOT's, flame throwing.....news to me! Won't this be interesting? milesy20 wrote: If we do not hire an internal or Wofford candidate then RJ has fumbled the opportunity to ensure stability and success. I seriously doubt that Wofford would commit the funds to hire away - with an appropriate HC + staff salary - an OC/DC/HC from FBS (or maybe even from similar FCS) programs. My initial reaction was to throw my support behind Coach Nash since he is a friend and was a teammate, with the impression from my playing days that Coach Lang would not want to move up to the Head Coaching position. However, we all mellow and have our priorities change as we mature and gain experience. If Coach Ayers provides vocal support for Coach Lang, then how could anyone ignore that recommendation? After 30 years of outstanding service, I feel like it is appropriate to accept Coach Ayers' recommendation and promote Coach Lang from interim to permanent Head Coach. If Coach Lang declines, then offer Coach Nash. If he declines, evaluate other internal and external candidates on the Coach Ayers tree. We need a Wofford Man. Do what Milesy says, and do it now! Didn't the Citadel hire from within? WocoSix wrote: Best man for the job plain and simple. It doesnt have to be a "Wofford" guy. RJ is doing due diligence which is what we hope he would do. He may have a short list but not revealing until the right moment. Who knows Rich Rodriquez may have parents in Spartanburg and wants to coach in Sparkle City. Not true but, you never know unless you put feelers out to see what kind of interest you get. WOCO, we are not saying Wofford guy first,we are saying best guy first, but in light of recent success of our team and strong talent we now have, and recruiting deadlines, the “best guy” unequivocally is a Wofford guy. That is not closed mindedness but rather recognition of the fact we have developed strong coaches over time. I agree with Milesy, as well! **Someone noted that guys he mentioned don't have head coaching experience. But can Wofford pay enough to get a successful head coach from just about anywhere else? Maybe there's a former head coach somewhere who has bounced around and is now an assistant somewhere....Or maybe a high school or D-2 coach. But I would guess it would be VERY difficult for WoCo to get a current head coach from another D-1 school. **I asked earlier -- but, again, is there any legitimately decisive negative about Wade Lang? If players don't like or respect the guy, then alright. If he just isn't all that smart and Mike Ayers has had to hold his hand all these years, then alright. If he's a squirmy guy or something...But I don't sense any of those things about Lang. And could anyone possibly be better prepared in Wofford's system or more loyal to the idea of doing things, football-wise and as a member of the campus community, "the Wofford Way" (if that still exists....)? I mean, I'm not arguing that he is the PERFECT coach for the job. I have no idea. But is there anything that should be anywhere close to a disqualifier for him? **One thought about not abandoning the run-focused offense: Joe Newman. I guess he didn't have a great year in 2017 as the backup. However, I think he's got HUGE potential. He could be the game-breaking quarterback Wofford hasn't had since, arguably, a guy named Graves. I know that's a short-term (two year) proposition. But to consider sidelining him and going out to find a big-time passer? Seems sketchy to me. **Oh, and just one other thing: Wofford was a successful option team back when Ayers was an assistant coach and Lang was a player, with Buddy Sasser as head coach. Went away from the running attack after Sasser left. It was six years of not-so-great football, the last two of which were an utter debacle. Then Ayers came back -- with Lang and with the option offense. The rest is history. I realize that was a long time ago. The situation is different now. But it's hard for me not to consider that history. Thanks for reminding me of my playing years Dude!! Those years playing under Billy Parker and Rick Gilstrap were total misery, but I still left with a love for Wofford and all it stands for. My personal pref would be in order: Fuqua, Nash, Lang but I am not sure Fuqua is ready to come back yet. But I do agree will all that the decision must be swift and with full confidence and support of RJ and the President. The Elephant in the room has just been barely touched-$$$$. Guys, the coaching profession has become very lucrative all of the sudden, and to keep really good coaches is going to be expensive as time goes on. We have incredible first class facilities but we horribly underpay our coaches-and it is understandable to a degree. However, one could speculate what could have been had we been able to keep our coaching staff together over the past five years. If we had another $20 million to endow our football staff things might change, but it is hard to see that happening. Assistant coaches moving onto better jobs at other schools is not only understandable, but also the mark of success. We would just like to be able to compete to keep them or hire good ones as well. It would be hard to expect a good young assistant making over $200,000 to come to Wofford as a coordinator and make half of that. It is the problem that needs to be addressed. Boulder you are correct. We have had some great coaches leave the program due to $$$ issues. When a coach leaves a FCS program to coach High School football it does not take a rocket scientist to conclude the assistants were not paid adequately. I have recanted my thoughts. Even if we got the best coach available would he be able to hire the staff he needs to be successful. That's why if we do hire outside it would have to be a less known hire ... I say someone like a Tom Knotts of Independence/Dutch Fork who has built National Power House programs in NC and SC and coached under David Cutcliffe (Duke HC) should be considered a candidate. Last edited by WocoSix on Fri Dec 15, 2017 8:53 pm, edited 1 time in total. The problem is that the norm has become to to greatly OVERpay coaches. However, we do need to pay a good living salary ... these guys work hard, for long hours. I for one do not know what Ayers and experienced assistants made, but I have the impression that we have kept up better the last 3-4 years. I also think they were dedicated and loved their work, which is a gift. The answer to the question of whether we can pay assistants is an unqualified No UNLESS those assistants have little experience/just starting out OR some serious relationship/connection to Wofford OR his wife makes good money. 3 of our current assistants have 2 of the latter qualifications and 2 have the former qualification. Citadel did in fact hire from within......and promptly won 10 games, went undefeated in the SoCon with a team most feel was the best ever. Was he living on Houston’s recruits? Maybe but those are the facts. Money is a HUGE issue; in attracting a top level coach with experience as well as paying his staff. We almost HAVE to hire within, although I think we are a very attractive job. However the days of 30 years longevity and loyalty are over. We are looking likely at a 5 to maybe 10 year guy. On the low end if he is an up and comer. I remember the "national search" for our baseball coach. My first choice would be Nate Woody, but I doubt we can afford him. In basketball, we kept it in the family, and Mike Young has done quite well. walliver wrote: In basketball, we kept it in the family, and Mike Young has done quite well. But the first number of years were painful and he turned the corner literally in the year that everyone was sharpening their pitchforks and lighting their torches. If Noah Dahlman was one year younger then things might be very different now (probably not for the better). I gather that RJ is a good manager of personnel and financial resources, but coaching hires may not be his favorite. I would hope the tension mentioned above is not the case, but too many who are more connected than I are sensing it which is a shame. If this is an RJ/NS vs. MA thing then RJ/NS are going to win. I guess office politics exist everywhere. If MA really wanted to force their hand he should have retired just before the start of the season, but that'd be a bit out of character for him. I'm disconnected enough not to know about the general hiring practices on campus, but that makes sense because Wofford's been slowly transforming since Joe Lesesne left. We seem to be moving in the same direction as Furman, Elon, High Point, etc., but maybe not travelling quite as fast. 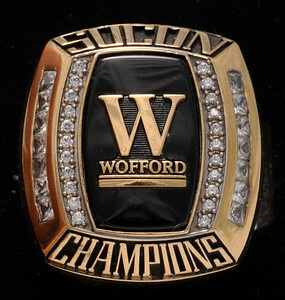 I'd hate to see Wofford lose it's sense of self, but some of that is just the way higher education is these days. If this drags on then I think pressure will mount, but that may not be enough. Everyday that a hire isn't made exponential damage is being done to the football program. I have preferences in this like everyone else and I am OK with exploring options, but there needs to be a hire before New Years. If it takes longer than that then we will really have a problem. Dahlman definitely saved MY’s job, primarily by recruiting Diggs and Rundles to Spartanburg (along with himself of course). Maybe this thing will move along a lot faster than we think. Yes Wofford is transforming, and not necessarily in a way many of us would like. Samhat who I think has seemingly done a respectable job (although I personally don’t agree with everything coming out of the President’s office) is a major vehicle for that change. I sense the BOTs may want that change. It is definitely not the Wofford of my era nor should it be probably. I just hope we don’t lose our identity (or at least what I perceive as our identity; Wofford is many thing to many people), who we are and what we are. And what matters. Losing those guiding values color day to day decisions negatively. And this is exactly the dilemma and questions being raised by this hiring decision. Who are we and what do we want to be as a program? It is a decision that may affect us for a decade or more to come. It took Furman 10 years to dig out of its hole. Citadel about the same. I just don’t want us to screw it up. But I am scared to death. MA would make a great AD BTW. How about Ma as quality control auditor for the AD?